Are you thinking about purchasing a dive computer, but you’re unsure about which one to buy? A dive computer is a fantastic piece of tech that can really transform your dives; however, they can be expensive, so it’s important to research them carefully before spending your money. Below are some of the main things you need to look for in a dive computer. The dive computer you select needs to have a clear screen that’s easy to read when you’re underwater. To ensure that this is so, you should find out if you can carry out some tests on the model you intend to purchase. For example, you should check to see if you can easily read the information on your screen through your dive mask and under water. The screens available vary from one model to another, with some of these products including color LCD screens that give you an even better diving experience. As well as being able to view your dive computer properly underwater, there will be times when you will need to check it when you’re on the surface or out of the water altogether. Many screens are difficult to read when it’s sunny, so you should ensure that this is not an issue with the model you decide to buy. When it comes to a dive computer battery, there are a number of factors you need to consider, so that your dive computer does not let you down. It should have a long-lasting battery, that is easy to recharge. If you are spending a long period of time exploring, your dive computer should have an easy to view low battery warning feature that indicates how much battery life your dive computer has left. The last thing you want to do is rely on it for depth and time warnings and find out the battery has died. Different divers have different requirements and preferences. You should find it easy to use your dive computer and you should be able to easily find all of the information you need when you dive such as depth, time and ascent rate data. The way this important information is presented is also vital. Some divers prefer to see numbers and letters, while others want their dive information to be presented through graphs and more visually appealing formats. Wrist and console dive computers are available and the type of model you choose, once again depends on your preferences and the activities you take part in when you dive beneath the waves. 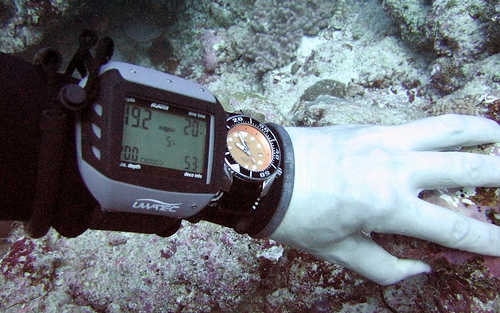 Some people prefer the convenience of a wrist dive computer, while other divers prefer not to have this type of device around their wrist while they dive and explore and prefer consoles instead. If you’re not under any time constraints when you dive, you can continue to dive until your air supply starts to run low. A dive computer that can be integrated with your air tank will inform you about the amount of air you have remaining. Not all dive computers work with nitrox, either, so keep this in mind. A dive computer is an important device that can aid your dives substantially. However, you should carry out the proper research before buying one. The points above will help you make a better, safer decision. You can also check out our favorite dive computers of 2017 here. This entry was posted in Scuba Diving, Water Sports and tagged Dive Computer, Dive Watch, Scuba, Scuba Diving. Bookmark the permalink.